Kohler is a well known name in the industry and one of their most advanced kitchen faucets is the K-72218-VS Sensate. It offers you the latest innovations to make your everyday tasks easier and faster. On top of that, it’s aesthetically pleasing and is built for durable performance. It’s not the cheapest kitchen faucet but if you have the budget and want a top-of-the-line product, you won’t go wrong with this model. Keep on reading our Kohler K-72218-VS Sensate review to get a closer look at the features of this product. The Kohler K-72218-VS Sensate is built in an elegant, modern design. It’s very minimalist, featuring nice clean lines of the body and the handle. Kohler also adds the signature aesthetic element that can be seen in all of the Sensate collection – a black bonnet. It’s a very subtle detail that just makes the whole design look more unique. The faucet’s high arc gracefully rises over the sink with a height of 15-1/2 inches and the spout’s reach measuring 10-7/6 inches. So it’s a better fit for bigger kitchens that have a deep sink. 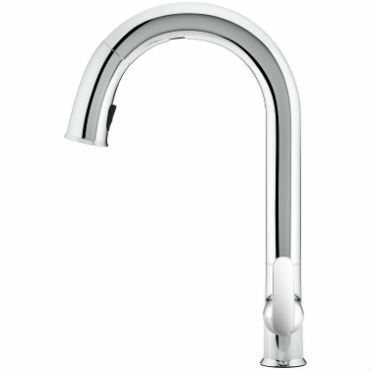 Mounting this Sensate kitchen faucet on a shallow or small sink can result in the spray creating a lot of splash. Also, before buying this faucet, check that there are no low hanging elements over your sink area, which could get in the way of the faucet’s installation. From top to bottom, the entire construction is made of premium metal. The high grade material provides years of reliable performance, proving time and again how Kohler managed to stay at the leading end of the industry for over a century. Kohler manufacturer also uses highly durable finishes, with the options for this faucet including polished chrome, polished chrome with black accents, vibrant stainless and vibrant stainless with black accents. All the finishes look sleek and choosing one or the other is a matter of preference. They are all high quality coatings that don’t corrode, rust or scratch and are very easy to clean. Just regularly wipe them dry with a soft cloth to keep up their glossy appearance. Another feature of Sensate’s durability is the ceramic disc valve. It exceeds industry standards and provides a long life of the faucet without any leak issues. The most outstanding feature of this kitchen faucet is Kohler’s intuitive Response technology that offers you the touchless operation. It works in tune with your every move, activating the water flow when you need it. The touchless technology solves the issue of a messy faucet. Oftentimes, working in the kitchen leaves your hands messy and then you spread all this mess also onto the faucet. Then, as different family members use the faucet, they also continue to spread the germs. To turn the water on, all you need to do it wave your hand or some object under the arc. The faucet has an inbuilt motion sensor there and its beam extends 6 inches from the underside towards the base. When you need to turn the water off, just wave your hand in front of the beam again and the water will stop flowing. However, if you want to change the water temperature, you’ll still need to use the lever. The sensor offers a very quick response time, activating the water flow in just 20 milliseconds. The sensor window is also precision designed, which prevents false activation of the faucet every time you work in the sink area. You have two options of how to power the touchless technology. You can either use 6 AA batteries or plug it into an AC outlet. Choosing the battery-free option is, of course, better. You won’t have the hassle of changing them every time and you won’t be polluting the environment with batteries waste. There’s also an LED light located right above the base of the faucet. If it lights up, it means that the fixture is operational and ready to go. The Sensate kitchen faucet is designed in a way so that it looks seamless. However, the end of the spout is detachable. It features the spray head that you can pull-down when you need to perform any up-close rinsing or other tasks. When not in use, a powerful magnet keeps it locked within the spout. But with a gentle tug, it unlocks and smoothly glides out. The manufacturer uses for this faucet its ProMotion technology, which you can find on most of Kohler’s pull-down designs. It features a light, nylon hose that connects to the spray wand using a ball joint. This provides the flexibility of the pull-down spray head, allowing you to maneuver it in any direction you need. You can operate the spray head in two modes – either regular stream or the Sweep spray. The latter produces a wide, powerful blade of water and can be used for tasks, such as sweeping off the mess on your dishes or other cookware. The Kohler K-72218-VS Sensate is designed for 1-hole installation. It’s perfect for those who prefer minimalism as it creates a clean, uncluttered look of the kitchen sink area. However, the package does include an optional escutcheon. So if you would prefer so or if your sink configuration requires so, you can also do a 3-hole mount. The product’s packaging also provides clear instructions on how to mount this faucet and also how to hook it up to a power outlet. Kohler also provides the flexible supply lines to further simplify for you the installation process. 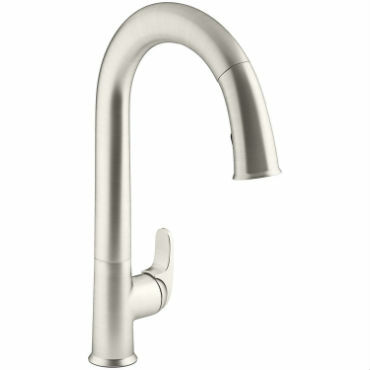 The Kohler Sensate kitchen faucet ensures efficient water use with its water flow rate at 1.5 GPM. It helps your home to conserve water, while not sacrificing on the user experience. Kohler also takes a step further with water conservation. There’s an automatic shutoff feature on this faucet. So if you’ve been running the water for more than 4 minutes, the safeguard turns off the flow. One more feature that makes the Sensate stand out is the MasterClean spray face. It’s designed with easy-to-clean spray nozzles that make it easy to keep the spray face free of mineral buildup. Offers extended reach and plenty of maneuverability. The touchless operation that can run on AC power. Precision designed for preventing false activation. The solenoid seems to be prone to breakage. A few users experienced it malfunctioning within the first year of use. If you’re someone who spends a lot of time in the kitchen, you’ll definitely love the functionality of the Kohler Sensate kitchen faucet. It’s a product of high quality and value that is bound to make your kitchen tasks a lot more efficient. Most of the users are extremely happy with the design, features and functionality of this faucet. On top of that, you can also get the lifetime limited warranty. However, we wish Kohler would fix the solenoid issue as it seems to be the main concern among users. Also, as we’ve mentioned in our Kohler K-72218-VS Sensate review above, it’s not a cheap unit but it might be worth its design and functionality. Faucets Rated Copyright © 2019.